Saint Patrick was a Christian missionary and a patron saint of Ireland. His birth name was Maewyn Succat but he changed his name after becoming a priest. He was not Irish as most people think. He was born in a Roman British family from Wales around A.D. 385. He is a saint of the Catholic Church. He died on March 17, 461 A.D. so 17th March is celebrated as Saint Patrick’s Day. This day is a cultural and religious celebration in the Republic of Ireland. At the age of 16, Saint Patrick was kidnapped and sold as a slave by Irish raiders. He spent six years in captivity working as a shepherd. He managed to escape somehow at the age of 22. Wearing green has become a tradition on St. Patrick’s Day but the original color associated with Saint Patrick is blue. Legend has it Saint Patrick banished all the snakes from Ireland but in truth, Ireland never had any snakes to begin with as the Irish weather is not suitable for cold-blooded reptiles. Beer is one of the most widely consumed beverages on the day. On March the 17th every year, parades are held in every major county in Ireland (state). Now St. Patrick’s Day parades are a global event. The first parade took place in New York City in 1962. It is the largest parade in the world. One of the Irish traditions is to pinch someone who is not wearing green on this day. On this day, rivers are dyed green with vegetable dye in Chicago. Saint Patrick used three leafed shamrock to illustrate his teachings. Now Shamrock is viewed as a symbol of good luck. It is also a national symbol of Ireland. 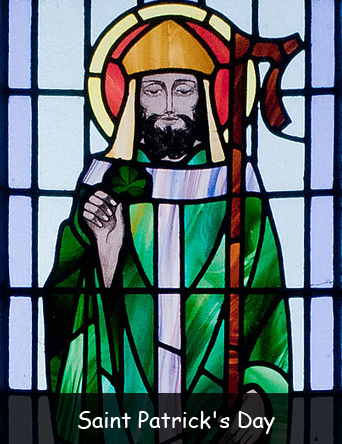 Saint Patrick is credited with bringing Christianity to the Irish people. Many iconic buildings around the world turn green on Saint Patrick’s Day such as the Eiffel Tower in Paris, Leaning Tower of Pisa, Sydney Opera House, London Eye, Empire State Building, Niagara Falls, Colosseum in Rome and many more. Declan, Tobin. " Fun Facts for Kids about Saint Patrick’s Day ." Easy Science for Kids, Apr 2019. Web. 25 Apr 2019. < https://easyscienceforkids.com/facts-about-saint-patricks-day/ >.